In a college basketball game, a timeout can change the course of a game. Now, thanks to the Infiniti Coaches Charity Challenge, a timeout can save lives. The challenge encourages fans to take a “time out” to vote to help their favorite NCAA men’s basketball coach win $100,000 for the charity of their choice. Over four rounds of voting, fans will help bring the field of 48 coaches down to a final four. The coach with the most votes after four rounds wins $100,000 for their charity. Each charity will receive money for every round their representative coach is voted through, with the minimum amount they receive increasing round by round. This year, three coaches have chosen to support local Children’s Miracle Network Hospitals. You can VOTE to help these coaches raise funds that would help save the lives of pediatric patients in their local communities. UPDATE (Feb. 13): Coach Mike White (Florida) and Coach Archie Miller (Indiana) have advanced to the third round of voting, already earning at least $10,000 for their local CMN Hospitals! Round 3 voting runs from 2/12/2018 at 1:00pm ET — 2/25/2018 at 11:59am ET. Coach Mike White is competing in the challenge to support UF Health Shands Children’s Hospital, the local CMN Hospital in Gainesville, Fla. The UF Health Shands Children’s Hospital represents the only quaternary-care academic pediatric center in North Florida. UF physicians offer some of the most specialized pediatric programs for the diagnosis and treatment of a wide range of complex conditions. UF Health Shands Children’s Hospital has 167 beds, including fully-equipped pediatric and neonatal intensive care units. To vote for Coach Mike White, click HERE. 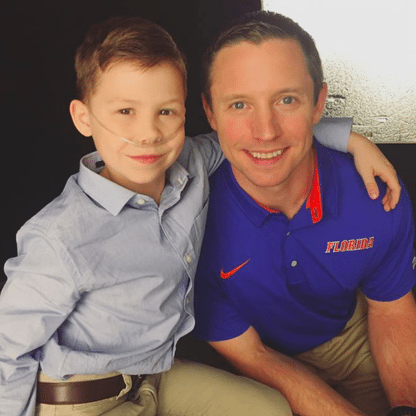 Florida Gators Men's Basketball's Head Coach, Mike White, helps Nate Ferrell share his story. Join them at Sebastian Ferrero Foundation's 2017 Noche de Gala, May 20 at the Exactech Arena! Hoosiers’ Coach Archie Miller has chosen to support Indiana University Dance Marathon through the charity challenge. IUDM is a student-run organization that raises funds for their local CMN Hospital, Riley Hospital for Children in Indianapolis, IN. Since its founding in 1991, IUDM has raised over $32 million for the kids in their community. Throughout each year, students fundraise by asking for donations from friends and family and participate in fundraising events and campaigns on campus and in the community. Their efforts culminate in a 36-hour dance marathon event in November where students dance, participate in activities, and hear stories from patients who have been treated at Riley. In 2017 alone, over 3,000 students helped raise $4,203,326.23. To vote for Coach Archie Miller, click HERE. 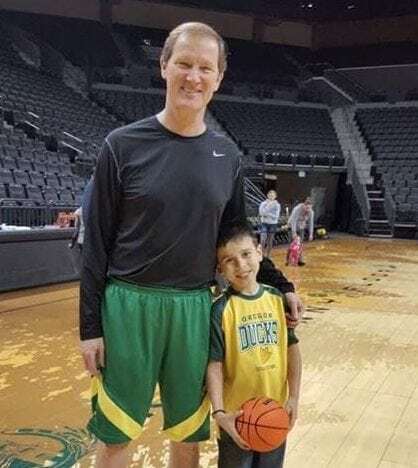 Coach Dana Altman has been a longtime supporter of Children’s Miracle Network Hospitals and his local hospital, PeaceHealth Sacred Heart Medical Center, in Eugene, OR. He has supported the hospital for many years, invited patients and their families to Oregon basketball practices, and has brought the team to the hospital to visit with patients. At PeaceHealth Sacred Heart Medical Center, CMN Hospitals donations help to provide equipment, educational programs, and special services that are essential in providing the best treatment and support for pediatric patients and their family. UPDATE (Feb. 13): Coach Altman made it to Round 2 of the Infinity Coaches Challenge, earning $7,500 for his local hospital. Children’s Miracle Network Hospitals® raises funds and awareness for 170 member hospitals that provide 32 million treatments each year to kids across the U.S. and Canada. Donations stay local to fund critical treatments and healthcare services, pediatric medical equipment and charitable care. Since 1983, Children’s Miracle Network Hospitals has raised more than $5 billion, most of it $1 at a time through the charity’s Miracle Balloon icon. Its various fundraising partners and programs support the nonprofit’s mission to save and improve the lives of as many children as possible. Find out why children’s hospitals need community support, identify your member hospital and learn how you can Put Your Money Where the Miracles Are at cmnhospitals.org and facebook.com/CMNHospitals. Next post: Local Miracle Kid, New National Champion!